The Returner's were a group of 4 rogue or rather lone Keyblade wielders rejected by the Master's of the Land of Departure for having natural dark affinities. 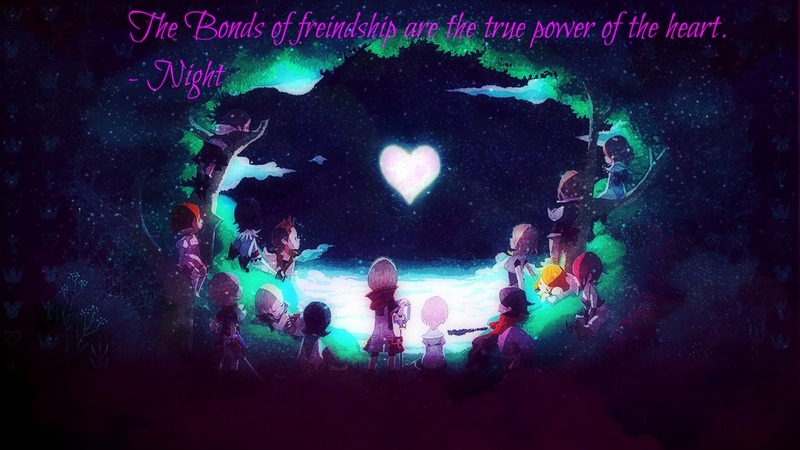 They generally stand between the light and dark and would rely on each other for support. The one who started this group was Semna. Personality: Semna is more than often closed and reserved. He only ever opens up a bit around his 3 friends. People who do not know him would presume he is cold and uncaring, but those who do know him understand he is a very loving person he just has a hard time expressing himself. He may be bad at expressing himself but he is very charismatic, and has a strong sense of loyalty. Bio: Semna was born and raised until 15 on Destiny islands. He always wanted to see the outside worlds, so when the keyblade chose him he was elated. A keyblade master shortly after came and took him to the Land of Departure. Very much like Night he was only there for a short while though and was thrown out for having a natural Dark affinity. This was a low point in his life. He traveled the worlds not knowing what to do. He would still battle heartless but more out of a sense of duty rather than actual responsibility. It was not until he met Nyrissa another rejected by the masters for having a natural Dark affinity that he found a purpose. 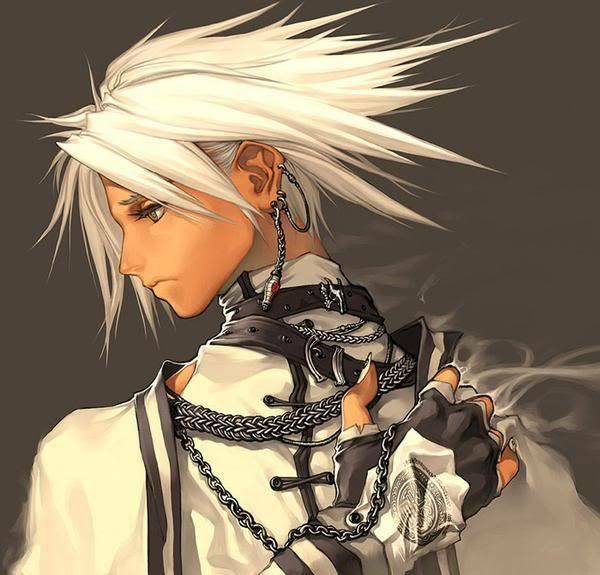 He started the Returners making it a home for any rejected by the Keyblade masters just for having a dark affinity. He decided that they would stand between and keep the balance there own way, and forge there own path in life. Appearance: Nyrissa had shoulder length red hair with violet highlights. She has golden yellow eyes and lightly tanned skin. She is about 5'5ft and 90lbs. she wears a red tank top with a pink Jacket over it and a red short skirt with red pink shorts under it. Her shoes are that of her Keyblade armor which is a pink and violet color scheme. She wears two keyblade armor gauntlets of same color scheme on her arms. her Keyblade armor looks similar to Aquas with a pink and violet color scheme, and ear piece like thing on the helmet are 3 pronged angel wings. 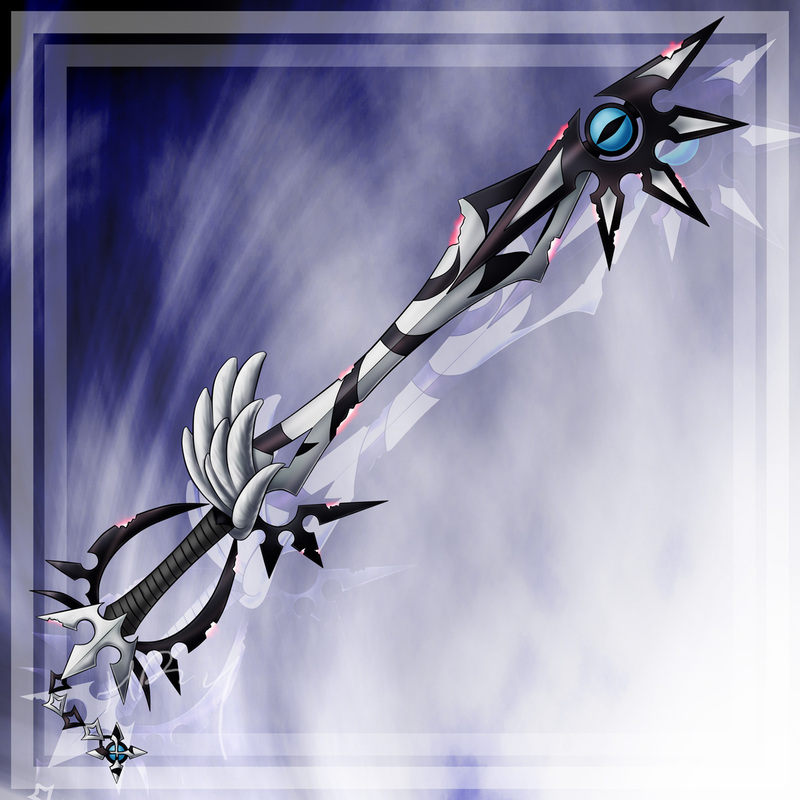 Weapon: Twilight twin angel, keyblade. Her keyblade is a dual edged keyblade. The keychains is a heart with a pair of wings enfolding upon it, one wing white, the other black. The hand guard is circular. 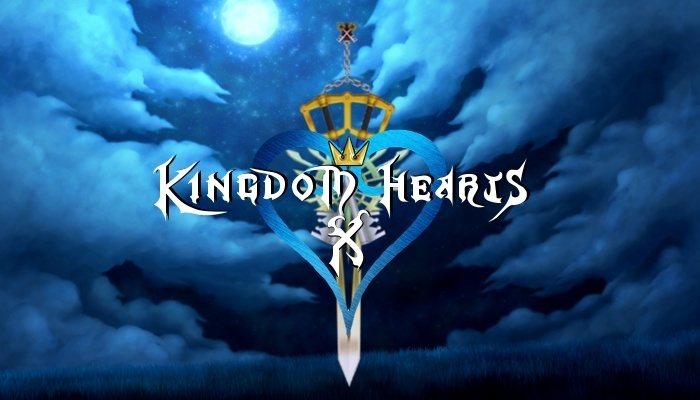 The whole keyblade is violet in color. The blade it self looks akin to a tuning fork with two prongs sticking up. on each prong is a wing, the one on the right is a black wing, the one on the left is white. Personality: Nyrissa is cool and calculating. She is also very head strong. She believes that one can overcome anything if they are determined enough. She also has a slight lust for power but usually can keep herself in check. She consider's those in the Returners like family ever since her own rejected her. Bio; Nyrissa has a rare upbringing. Bother her parents were keyblade wielders and were masters at the Land of Departure. So when the two had a daughter it was no surprise that she could wield a keyblade. many had high expectations for her, and many thought she would excel. At 15 she started training. It was quickly discovered that she had a natural affinity for light. This only caused more of a stir. Many expected greatness from her. She had been training for a whole year when her darkness affinity awoke. Her life was never the same again. She went from star pupil to her own parents rejecting her and casting her out. Sometime later, Semna found her. He offered her a helping hand. More importantly he offered her a place were she felt like she belonged. For a while she thought she was in love with Semna, and this caused some friction between her Night when Night joined. But this ended when she realized she only loved Semna as an older brother. Though she was still slightly jealous of the princess. note the shirt is white. He also wears jeans and sneakers. he wears a red keyblade armor gauntlet on his left arm. Also instead of the tie he wears a silver chain necklace with a silver flame pendant. His Keyblade armor is a red version of Terra's with a violet flame design. 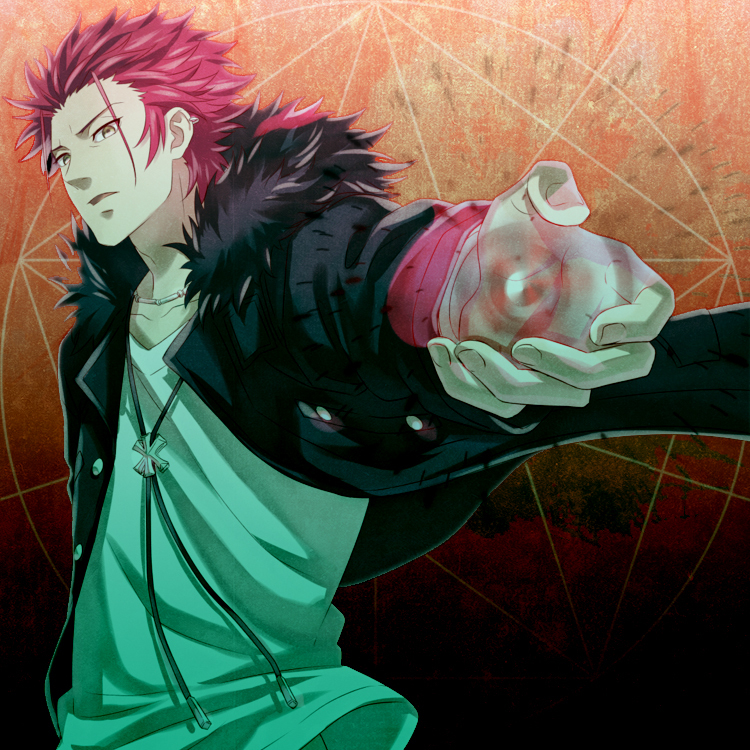 Personality: Kuro is loyal but hot headed. He has a temper and has no problem getting into a fight. He mostly gets defensive when it comes to his friends, and often takes rash actions. He is the kind of guy who lets his emotions rule him, but he still puts his friends above himself. Bio: Kuro was born and raised in Twilight town. He ended up the leader of a gang of kids. He did not get why they wanted to follow him but he decided he would protect them. He often would be a part of the struggle tournaments and was the champion of more than one. When he was chosen by the keyblade he really did not understand what it meant. With the keyblade though his true affinity for fire was awakened. It was only a short time until he drew the attentions of the keyblade masters and they took him to train. along with hopefully cool off his hot head. It did not take long though while training for his dark affinity to awaken though, and the masters with ease and no hesitation through him out. He was hurt by such rejection. He was shortly after then tempted by Maleficent to join her side, but the Returners intervened in the dark Fairys plan which would have ended in Kuro's enslavement. Semna then offered Kuro a place within the Returners and he gladly joined finally feeling like he had found a home.